Online sailplane competition event this weekend (Feb 15 to Feb 17). Meet Hessian flying the ASK-21. What a nice flight! Here are screenshots. * Add ASK-21 trainer glider. * Improve graphics and overall performance. * Improve 360 look around. * Improve graphics & performance. * Add facebook & support links. * Improve flight physics & effects. Coming up release 1.2 is now waiting for approval. Have you ever dreamed of soaring the sky like a bird, circling on an invisible thermal and staying aloft just by your skills and the forces of natures? Or are you already a glider pilot who looking for more funs while you’re not flying? Welcome to XtremeSoaring3D, one of the best soaring/flight simulation available for mobile devices. XtremeSoaring3D manages to capture the beauty, the excitement and the technology of the soaring sport. 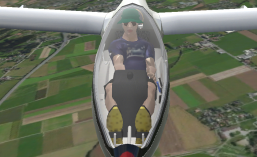 In XtremeSoaring3D, the cockpit is highly simulated with ultra-realistic 3D cockpit, full function dash-board, realistic sound effects and all moving parts. Flight characteristics are also highly accurate thanks to the Blade element theory. Wings are breaking down into several small parts and then determined the forces on each of these small elements. These forces are then integrated along the entire wing in order to obtain the forces and moments produced by the entire wing. This results in a highly dynamic, accurate flight model for each specified aircraft with wing-flex simulated. All together this sim put the human pilot into an highly immersive flying environment. Thermal lift and ridge-lift are also highly simulated and could be visualized in flight. Beside flying, the beauty of soaring sport is also the landscapes, the countrysides that we glide over. Therefore, we manage to integrate terrain data in this sim using high resolution satellite images and elevation. This resulted in a look real, beautiful landscapes with highly detail airport hangars and runways. * DG-808S high performance glider, ASK-21 trainer with full function cockpits. * 360 degrees look around cockpit, and multi-touch zoom. * Realistic terrain with high resolution satellite images, detail airport. Currently available Austria (Coming soon USA, Germany, France flying sites). * Realistic flight characteristic, accurate performance, wing-flex. * Realistic flight instruments, Total Energy Compensated variometer. * Multiplayer over the internet.